Happy Women's Day To All of You Dear Friends! Today, I am with a guest post from my sister Bharati. She is the one who gave her Fruit Halwa recipe & Interview for my guest post series started in 2010 March. You can read her interview here. Some of her recipes in this blog are Aapam - Thenga Pal & Coconut Milk Noodles . 4. Water - Needed Qty. Deskin the Raw Jackfruit. Cut into cubes. In a vessel, take water. Add turmeric powder & a little salt. Allow the cut raw jackfruit to cook until soft. Take care, it should not be overcooked. Drain water & let it cool. Marinate the cooked raw jackfruit with all the given ingredients for marinating. Leave it aside for 2 hrs. 5. Few Saffron threads mixed in 2 tbsps of milk. 1. Cook soaked basmasti rice in thick bottomed vessel with a little oil, whole spices & salt. 2. First remove & drain half of the 40% cooked rice. Spread in a plate. Cook the remaining rice to 60% & drain. Spread this in another plate. 3. Take a big wide mouthed vessel or Biriyani vessel. Spread 2 tbsp of oil at the bottom . 4. Spread the marinated Raw Jack fruit at the bottom. 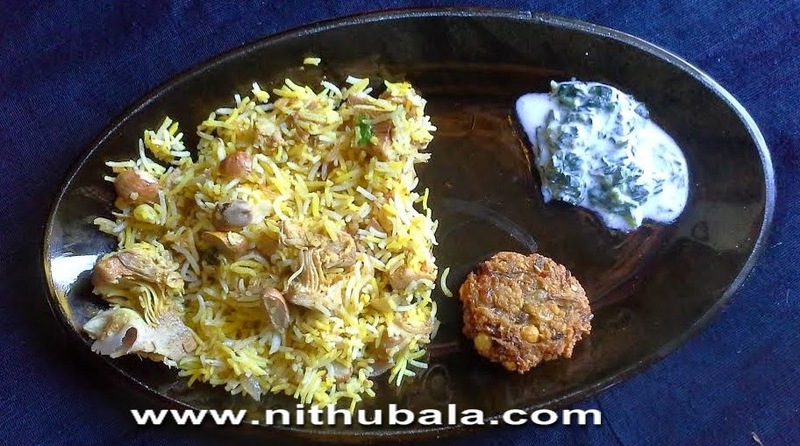 Top it with 40% cooked rice, fried onions, coriander leaves, a tsp of ghee, a tbsp of saffron mixed milk . 5. Now, spread 60% cooked rice, fried onions, coriander leaves & a tea spoon of ghee & a tbsp of saffron mixed milk. 6. Close it with a lid tightly. Paste the rim of the vessel with the chappathi dough. 7. Keep this vessel over a preheated tawa & let the flame be in high for 2 mins, then medium the flame. Above the lid, place some weight like a big vessel filled with water to make dum cooked biriyani. Let it be on the stove for 45 mins. 8. Remove & keep it as such for another 10 mins. Then remove the lid. You could see a fluffed rice emanating a very nice flavour. 9. Serve hot with raitha.